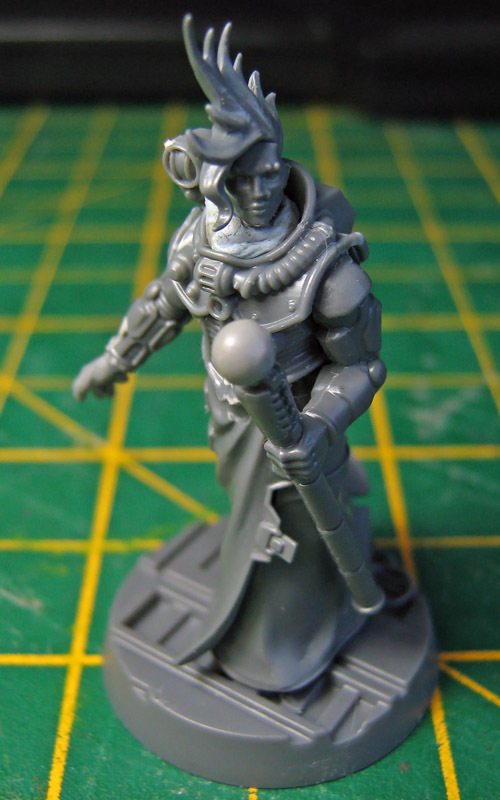 My nostalgia tends to be mostly for models from the 1997-2003 era - the kind of stuff that was either released or commonly on tables in the early few years of my hobby. As far as Belladonna, to the top of her head and counting her heels, about three quarters of a head taller than the couple of old Jes Goodwin Escher I have. The hairdo exaggerates that a lot, but she's not unthinkably tall alongside the older models. 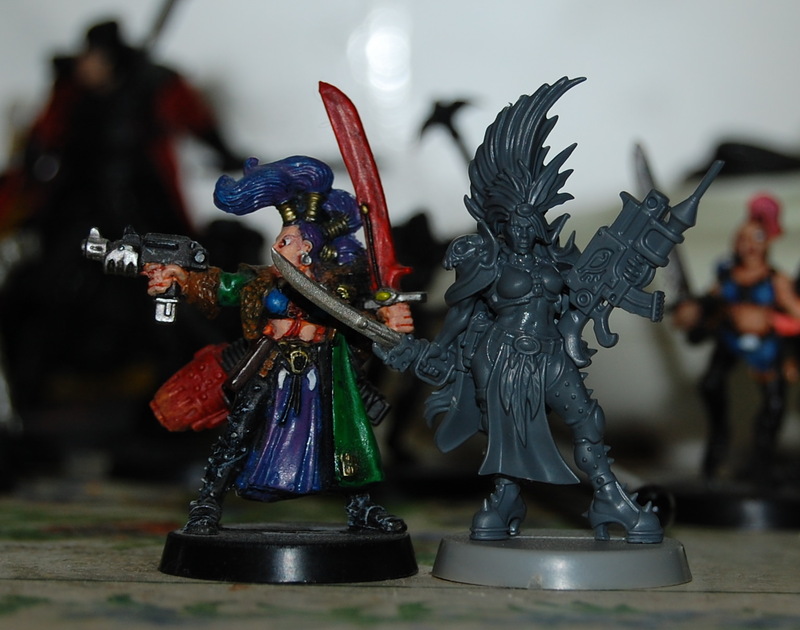 I do actually have the plastic Escher box about, but I've not assembled anything yet, so I can't say definitively how those match up height-wise, but my instinct is that Belladonna, being somewhat slighter of figure than the new plastics, better matches the old metals stylistically. Progress on the six sisters has unfortunately not been great - the hot weather in the UK has meant that working on metal models has become a bit frustrating, even for me, with tiny little parts trying to escape from slightly sweaty fingers. Two of them should be ready for Guardian, the other four will probably have to be painted without conversion, but I should be able to strip them back and customise them later on. However, I've decided exactly who Belladonna is becoming - but I can't yet tell you who that is, because it would be a spoiler for the upcoming event. She's resin, of course - which, aside from being less of a problem with slightly sweaty fingers, is a wonderful material to work with. It may not even be immediately obvious that the legs and feet have been reposed - although it's strictly for soldering surface mount components, I have a temperature controlled hot air wand that can be used to warm very specific parts of resin models, so it was fairly easy to turn her leg out more. Also, I decided I wanted to lose the high heeled boot, which didn't feel right for the character, who... well, suffice to say that while presentation of a sort is actually basically the character's entire raison d'etre, right now it means knuckling down and doing things. So, similarly, I could flatten out the foot with the heat wand. Continuing the point of presentation through practicality, while it's probably sacrilegious, but I think I'm going to give her a more subtle hairdo than the model/art started with. 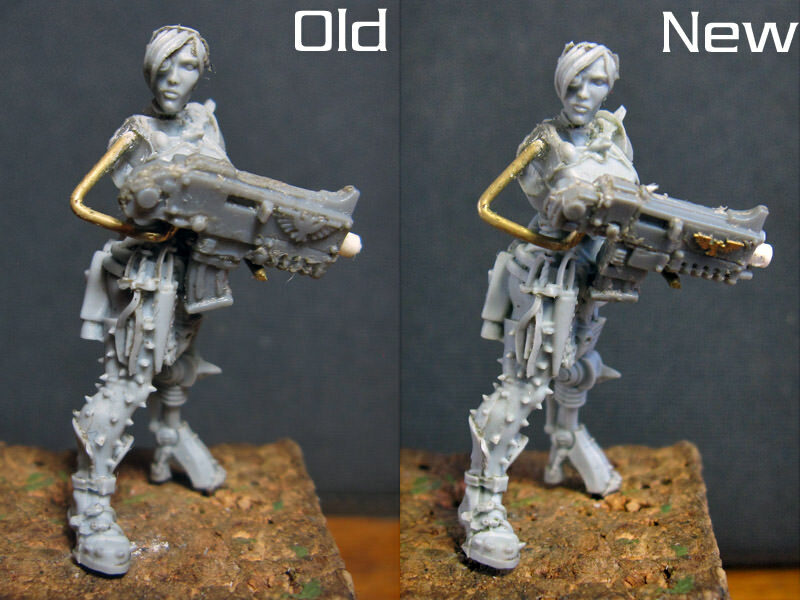 As far as her weapons, I'm having a bit of trouble with that, as the model's bulk is not consistent of most of what's in my bitz box... or even the new plastic Escher that I have. While this bolter has been slimmed down, I may potentially have to resort to stealing Greyfax's again slightly smaller bolter. The stake crossbow component is not actually inappropriate for the character (but, again, spoilers), but might present a posing issue. Thoughts? Is the bolter too big? 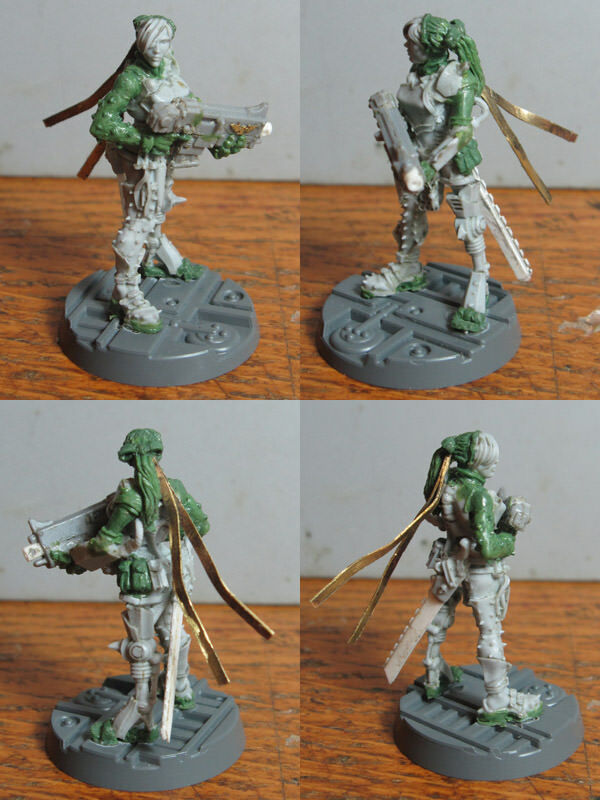 Most people seemed to agree that the bolter was a bit too big ( even though I'd tried to shrink it down a bit), and I didn't have most of the suggested alternatives (being as I'm an old fashioned type who has basically no kits made in the last decade), so I've taken a stab at combining bits of bolter and bolt pistol to create a weapon more appropriately scaled to the model. Obviously I'll need to clean up the scars on the casing, but how does the size look now? 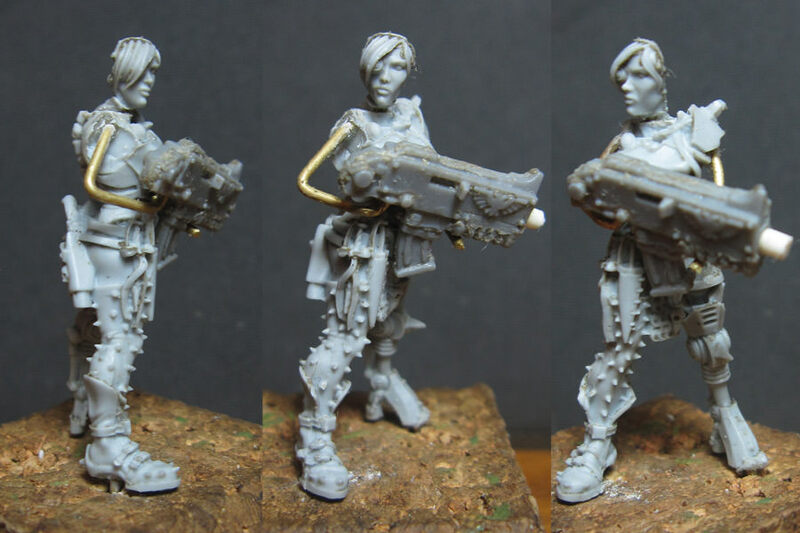 The other alternative is finding a different weapon entirely (a lasgun might be more svelte, particularly as I have some Forge World Elysian ones), but while I'm normally quite hesitant to give bolters to Inquisitor characters, the bolter does feel right for the character's (still secret) background. 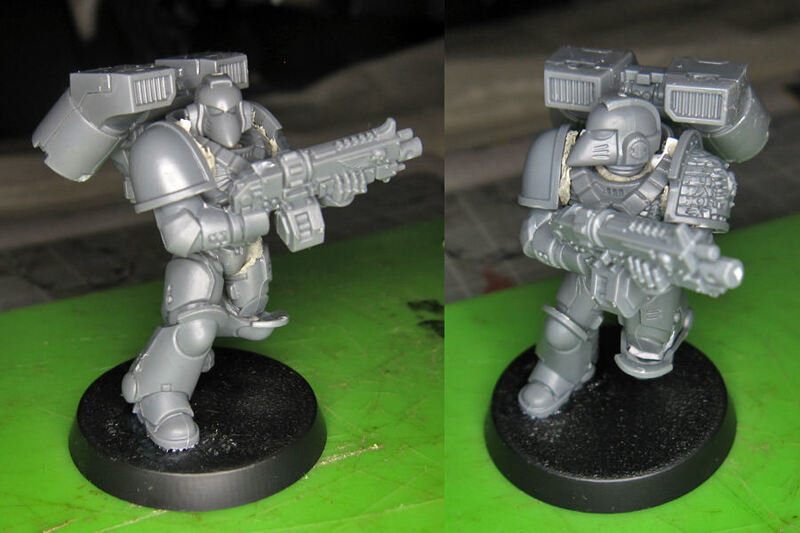 The smaller bolter looks much better. I think the reduced size looks much better. It's still kind of big, but I think it creates a nice contrast with the smaller-framed character. Intrigued to see where you take the sculpting. She's not completely finished (she still needs her hair, loincloth and bracers sorted, as well as a little clean up, but I intend to handle that tonight), but it does give a rough idea of where I'm going. As far as the pose giving her only one weapon compared to the pair that most daemonettes wield, I'm currently working with the idea that their daggers and claws are summoned/morphed at will. Although it's perhaps slightly towards the Tzeenchian end of the spectrum to have a daemon morphing themselves, I think it's a plausible enough effect for a daemonette - I can see a certain creepy beauty in a claw morphing away into a slender hand as they stand over their latest victim. Sorry, I've realised I'm a complete doofus and have still failed to update this thread. While Lady Helena Van Brasing (the now declassified name for the Belladonna conversion) is still waiting for me to finish tidying up her paintjob (it wasn't entirely finished for last weekend), I forgot to post the final pre-undercoat pictures. There was a bit of a last minute panic when I decided that I actually wanted her to have a chainsword rather than the plasma pistol she had, but I didn't have a dang chainsword in a good size for the model. Fortunately though, this took a lot less time than the bolter took to sort - the plasma pistol had a fairly straight grip and wasn't too recognisable shape wise once the muzzle had been removed, so it was a plausible hilt for the chainsword. Spinning it around and adding some plasticard (three layers of .25mm plasticard, with the middle layer wider than the others so I could serrate the edge) fairly quickly turned it into a suitable weapon. I hope to get the painting finished at some point soon, and I'll also try to get a picture of the Winterholme sisters - although the work on some of them is WIP/temporary, as the intention is to go back and convert more of the sisters over time (I needed them functional for the "Guardian" event, but I do hope to make them all individual as I find time). I'm also going to admit to the purchase of a box of Primaris Intercessors, as I think they're a nice improvement on the Space Marine design and I should probably visit the Adeptus Astartes for 28mm Inquisitor eventually. Whether or not I actually do anything with them or hit my normal plastic phobia may be another matter though. 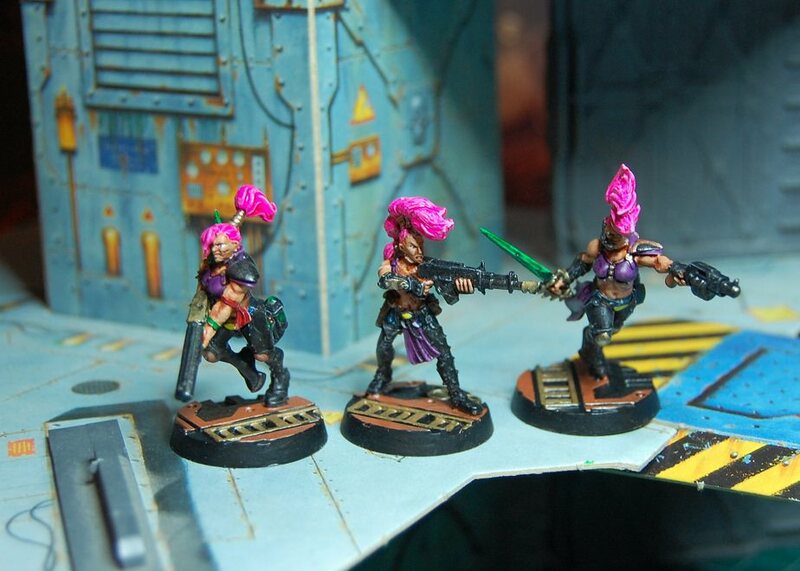 Great repose of the daemonette. Adds a predatory sense of menace. 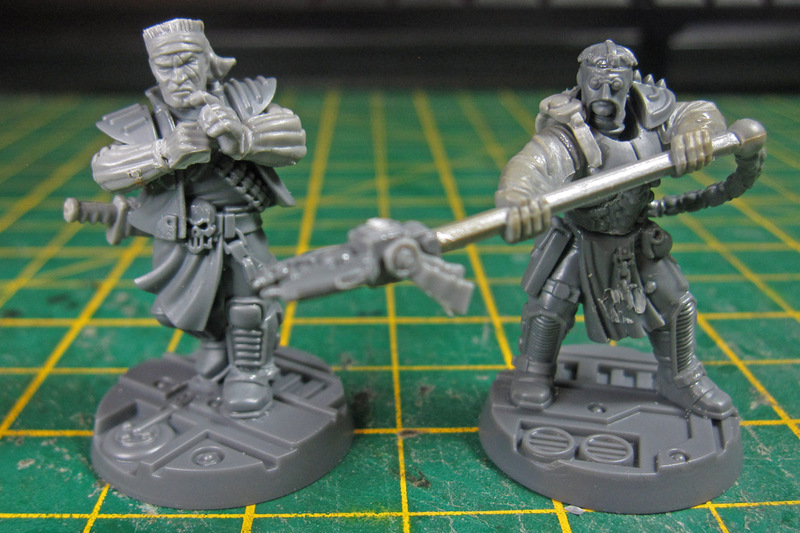 The chainsword is nicely done on the Belladonna conversion too. I'm currently on a narrowboat, so the idea of tidying up the last of the painting on Helena is a bit optimistic. However, returning to the earlier mentioned box of Primaris, I've decided that turning some of them into a small Deathwatch squad is a good start, as it allows completely eclectic and decidedly non-standard equipment load-outs that work well for the Inquisitor ethos. The thought here is a somewhat unconventional use of a jump pack, not for getting into melee, but instead in combination with an auto bolt rifle for mobile suppressing fire and rapid flanking manoeuvres. I'm not sure if the model will keep the Mk6 helmet - while I probably want a Raven Guard or successor in the squad, I'm now thinking they might be better kept for an infiltration specialist, and instead let another chapter fill this role. Still not a massive fan of plastic, but I do like these models - they feel like what Space Marines should have been originally. 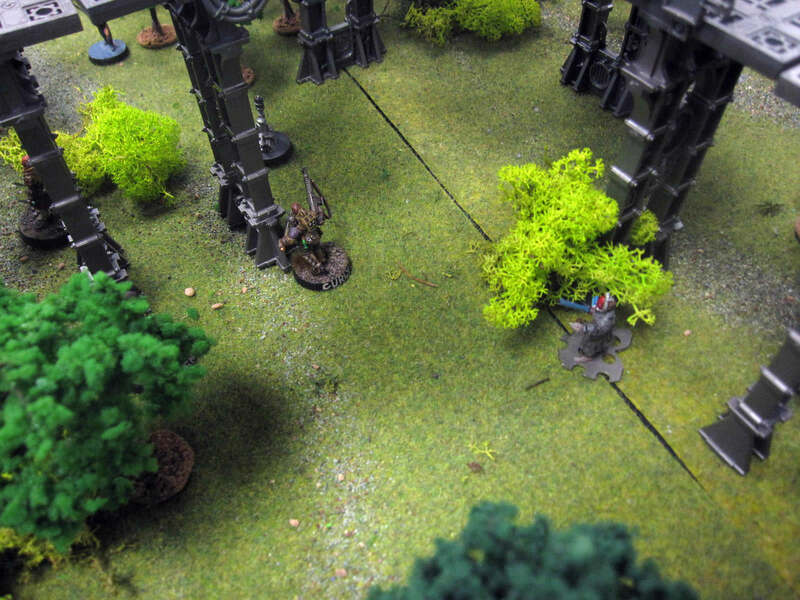 I'm finding that intercessors are actually kind of fun to mess with - for as much as they allow, anyway. They don't seem too limiting. They're not naturally compatible with all older parts, but it's not overwhelmingly difficult to swap in older chest plates and the like - a few gaps to green stuff, but for a small custom squad, that's not unreasonable effort. 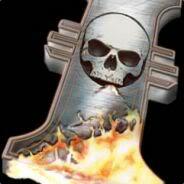 Anyway, I suppose I should actually post stuff to try and promote a little activity on the site. Although my forest table is now achieving a fairly respectable tree density (there are a few extra trees here than when it was at the LGT), I will concede that it does need more "not trees". 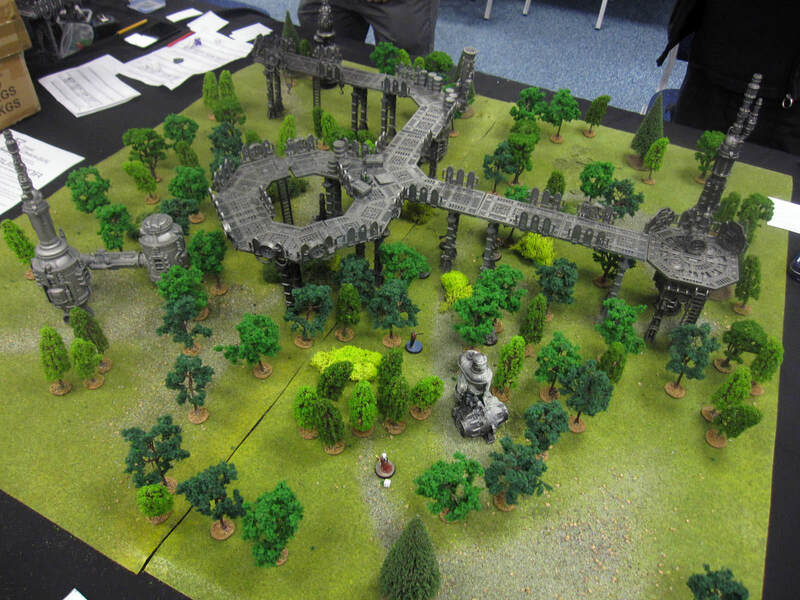 Right now, it's fairly good when supporting other terrain (such as the Sector Mechanicus terrain here, which was Dark Sphere's), but it's not enough to make a table on its own. Adding a bag of lichen (and I'll likely add another) to the set has started to add some variety, but to achieve a table that meets the needs of Inquisitor, it is going to need more scatter terrain. 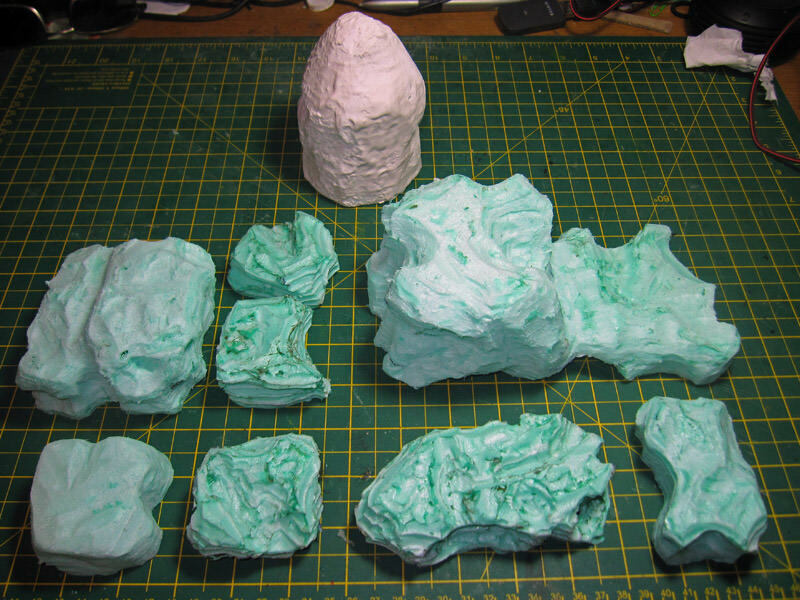 So, here's the start of some rocks. I struggled to find thick extruded polystyrene locally, so I've eventually had to build it up out of layers to get the right thickness. This has made working with it more of a challenge, as the PVA only really sets near the edges, so with a normal craft knife, it usually starts falling apart after you start carving it up. A hot knife works better, but the PVA doesn't melt quite as much as the foam, so I have to sand it down afterwards. And the sheets are also a good thickness for jobs that might be more traditionally handled by thick cardboard. 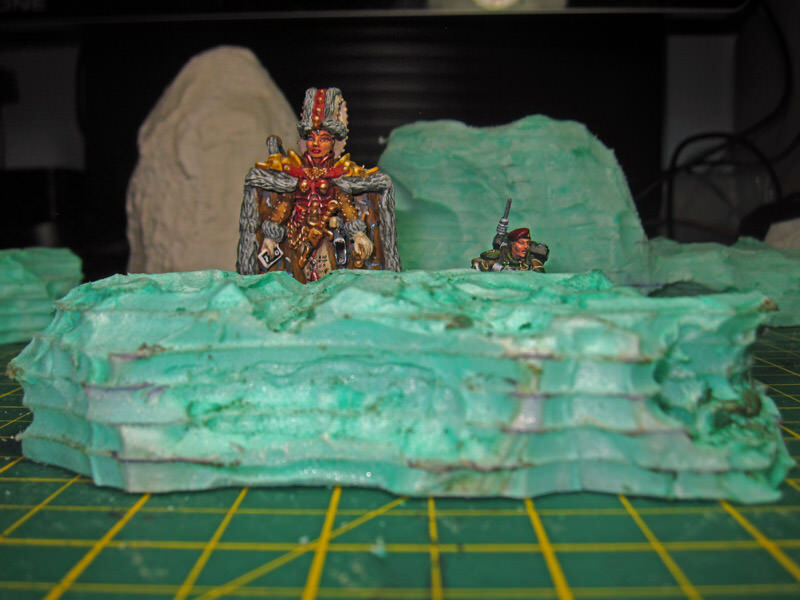 Here you can see the construction of some river sections (well, more of a stream for 54mm characters, but still a water hazard). A massive advantage of the material in this role is that the strips of foam I'm building the banks out of were originally cut straight, and can be bent quite easily to match the curves of the river with a heat gun. 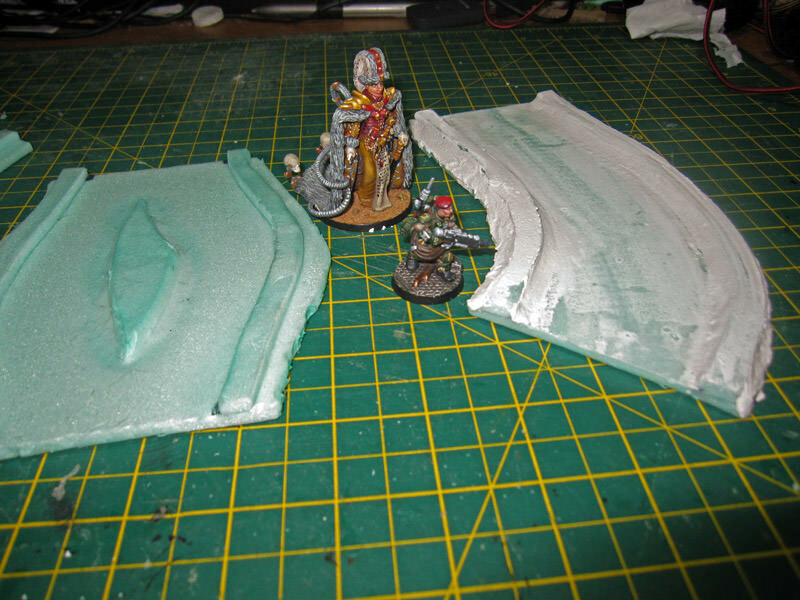 Hopefully, the foam should prove more crush resistant than cardboard, which should make it a bit more suitable for transport (a significant concern for the terrain I make, given that most of my games are at events). Following up on my need to produce a crowd of citizens for the upcoming "Fracture" Open (given it's going to be set around a political revolution), a large pile of boxes turned up yesterday. 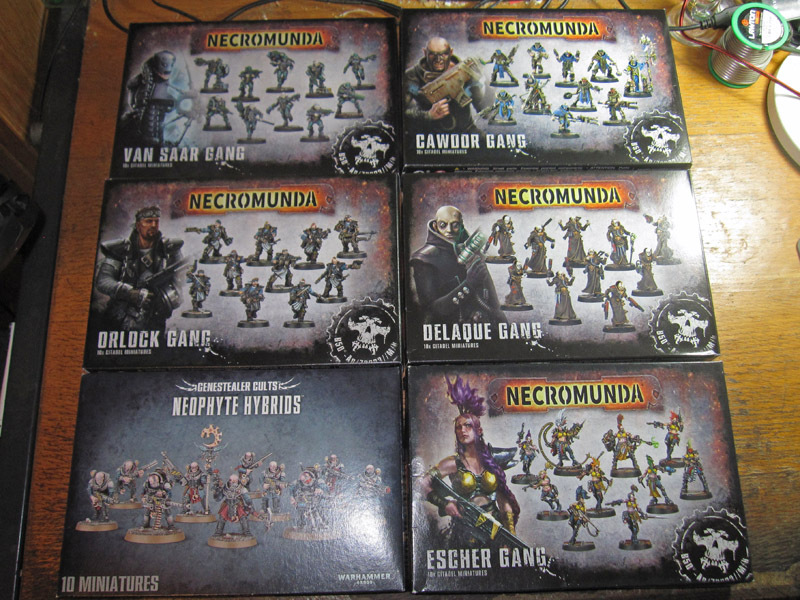 There are several non-GW kits that people have recommended that I've earmarked as possibilities to add to this pile, but this is already a lot to start with (particularly if I can find any left-over Catachan or Empire bits in my bits box). 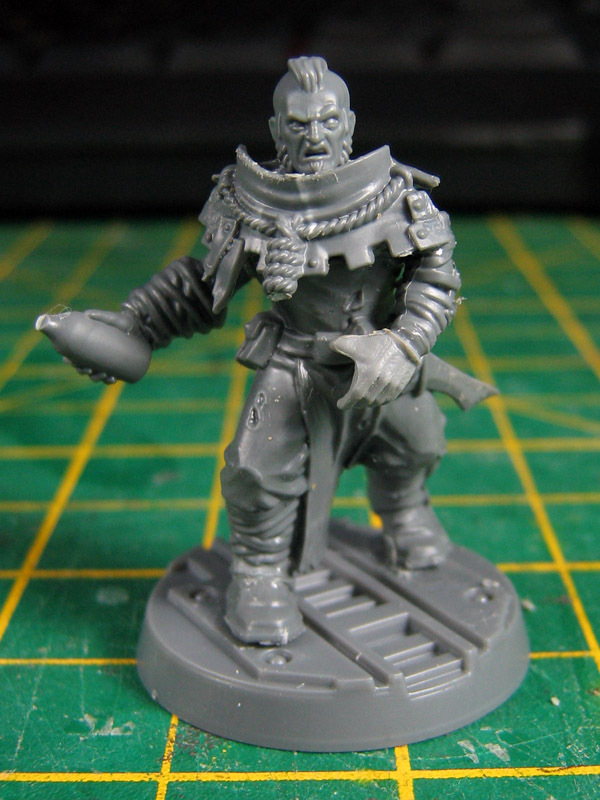 Obviously, I don't really like working with plastics for Inquisitor (compared to my normal medium of painstakingly dissected whitemetal and greenstuff), so the kitbashing approach is going to be a bit of a learning experience, but I've taken a stab at one model already, who I'm currently dubbing "The Administrator". There's various changes I may or may not make - either a male head or otherwise adding a few curves with greenstuff (although I've already slimmed the shoulders to make the silhouette a little less broad), and maybe some more/different gubbins - but I'm reasonably happy with it as a start. Three more - still all WIP, but I'll be working them up in batches to do greenstuffing. It's been largely decided that the Hardman probably needs a new head, as this one is a bit oversized, and that the Beastmaster needs some livestock to look after, but I'll work on that later!